In some ways, I’ve become accustomed to hearing music without actually listening to it. It’s not uncommon for me to slip a CD into my computer and have some vague awareness of words pouring out of the speakers as my attention turns elsewhere. I’m as guilty as anyone of thinking my time is too valuable to focus on just one thing. 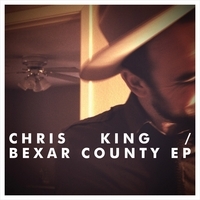 Receiving Chris King’s new EP in my inbox was an unexpected gift. In an increasingly hectic world, King asks the nearly unthinkable of his listeners: he wants them to slow down. King ambles through Bexar County with the haste of a preacher making his way through a Sunday sermon. However, far from making the listener fidget, it’s a welcome change of pace. This is a recording the bears repeated listens as you attempt to catch each twist and turn of phrase. King’s previous EP This New Almanac showed that he’s a keen observer of people and relationships. Bexar County, nearly a year in the making, further continues that perception, revealing a rapidly maturing artist and man. Backed by tasteful and often understated instrumentation, King may seem like a throwback to singers from another era, but his traditional-minded ruminations are equally relevant today. Despite living in a world beset by change, there are constants, including lust, loneliness, and the need to seek solace in a song. At the other end of the spectrum, the acerbic, slow-burning ”Parade” details a relationship falling apart. Featuring co-writer Jamie Wilson of the Trishas, the duet contains bittersweet wit. King and Wilson work well together, confidently answering and skewering one another. While other artists may blast your eardrums in a time where “loud + fast” apparently equals fun, King relies on subtleties. Like much of the rest of the record, the velvet vocals on the gorgeous “Heartbreaking” slink into your consciousness. Wounded but not completely jaded by love, although King ruefully opines that “heartbreaking and heartaching are gonna kill us all” you get the feeling that he wouldn’t have it any other way. While (regrettably) his voice may not be one you’ll hear with frequency on the radio, King’s Bexar County is certainly worthy of your attention – and more than a passing listen.